Google’s PageSpeed Insights tool provides valuable information that can help you see exactly how fast your website loads for the average user, and what you can do to improve your website’s user experience. The most recent update to the tool added new User Experience rules that can help you make your mobile website load faster than the average seven seconds. Your website’s viewport controls how your site displays on a mobile device. When set up properly, your viewport can help you control how your pages scale on different mobile devices. Failing to configure it properly will cause mobile devices to render your website in standard desktop screen width. 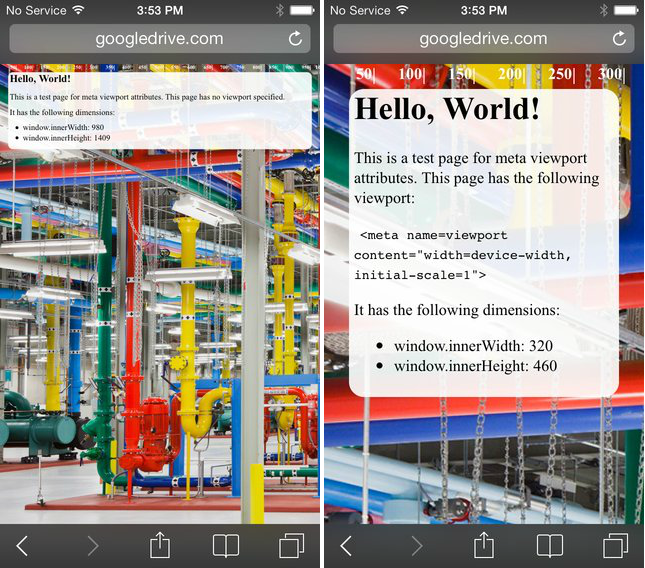 The image above shows how a website might appear on an iPhone when the viewport is not configured (left), and how it scales when the viewport is configured properly. After configuring your viewport, you need to make sure your pages’ content width fits it accordingly. Forcing users to scroll horizontally or zoom out to see your whole page doesn’t provide an optimal user experience. Don’t make users zoom in just so they can see the text displayed on your pages. Make sure your font size scales automatically and allows users to read your content comfortably without having to zoom in manually. Like I mentioned in my post about call-to-action buttons, you need to make tappable or clickable elements large enough for users to see and interact with them properly. Making your tap targets too small can frustrate users, who might end up tapping on the wrong button or link. Many mobile devices do not support plugins like Flash, Silverlight, and Java, so your website should not rely on them to function. A plugin-heavy website might cause hangs, crashes, and other errors on mobile devices, which completely ruin user experience. With these updates, the PageSpeed Insights Tool has become even more useful to anyone who wants to build a website that provides an excellent user experience across different platforms.